Henry Slaughter, born on the 18th September 1853, was mobilised on the 20th February 1915 into the Rroyal Navy from the reserve and served until the 23rd July 1919 - and was awarded £24 in ‘Naval Prize Money’ in October 1922. 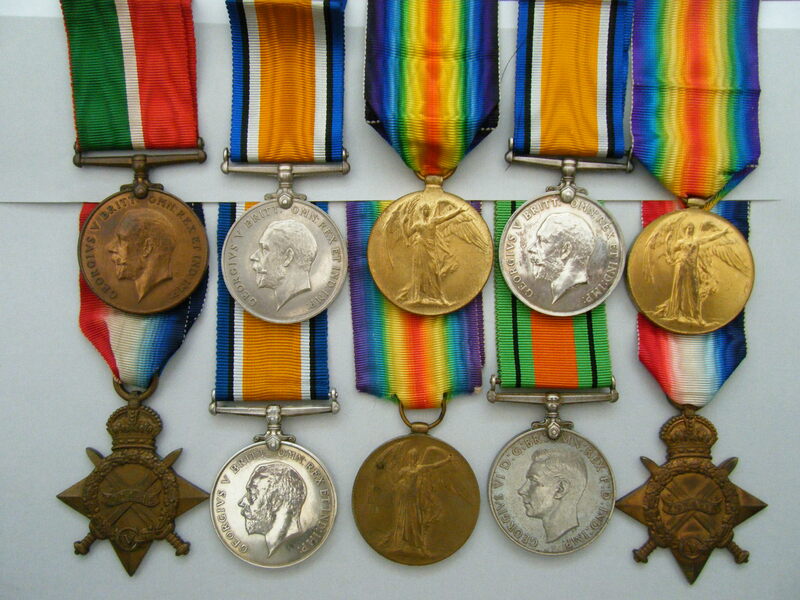 Sidney Slaughter joined the Royal Field Artillery and moved with his unit to France on the 11th December 1915. His medal group included a defence medal and a Home Guard badge, so it is assumed that he served in the Home Guard during WW2. William Hugh Slaughter, born on the 6th March 1892, was mobilised on the 24th January 1916 and appointed acting Lieutenant on the 29th November 1916 followed by being made Temporary Lieutenant on the 26th November 1917. From what I can understand of his Royal Navy service records, he served as a navigator and took his ‘Master’s Certificate’ in 1919. Ships referenced in his service records include: HMS. Nigella (in February 1916) - which was one of thirty-six ‘Arabis Class’ sweeping sloops completed for the Royal Navy and HMS Swordfish (from June 1916?-19) an experimental submarine. After the war, William Slaughter moved to South Australia (Semaphore now a suburb of Adelaide), and arrived there in June 1919. He was formally demobilised from the Royal Navy Reserve on the 8th August 1919 after he had confirmed his arrival in Australia. Details of HMS Nigella can be viewed by clicking on here and HMS Swordfish can be viewed by clicking on here. 1915 Star named to S.A. 1419 H. SLAUGHTER., 2.H.D. R.N.R. 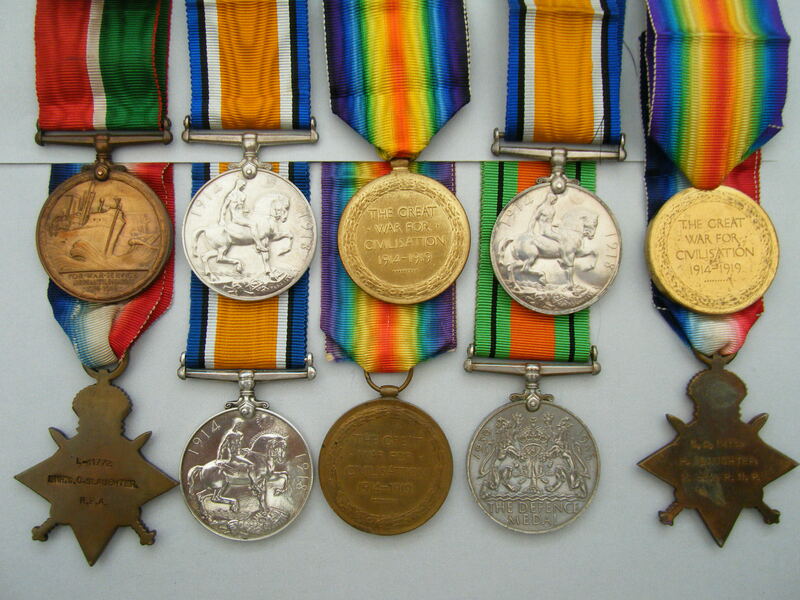 British War Medal and Victory Medal named to 1419S.A. H. SLAUGHTER., 2.H.D. R.N.R. The ‘2 H.D.’ stands for ‘Second Hand’ suggesting he was a professional Seaman before joining up, and was likely to hold the position of 2nd Hand. To do this he would have to have a Mates Certificate of Competence (Fishing Vessel) issued by the board of trade. 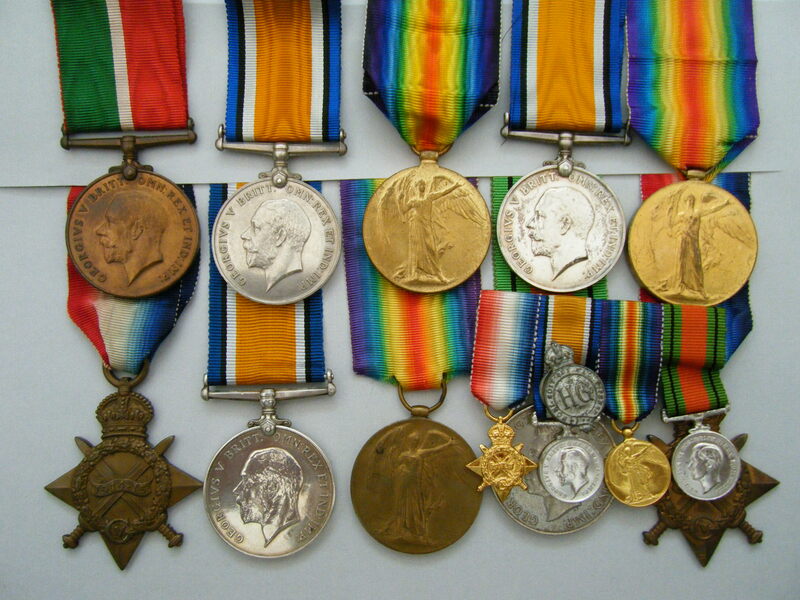 Included with this listing is a paper copy of his service records and a copy of the medal roll entry for his awards. 1915 Star named to L-11772 GNR S.C. SLAUGHTER., R.F.A. British War Medal an erased gap filler. Victory Medal named to L-11772 GNR S.C. SLAUGHTER., R.F.A. A set of matching miniatures. This group come with a paper copy of his Medal Index Card, which can also be viewed by clicking on here (if you have access to Ancestry). I have been unable to identify any service records relating to this man. Mercantile Marine Medal named to WILLIAM H. SLAUGHTER. 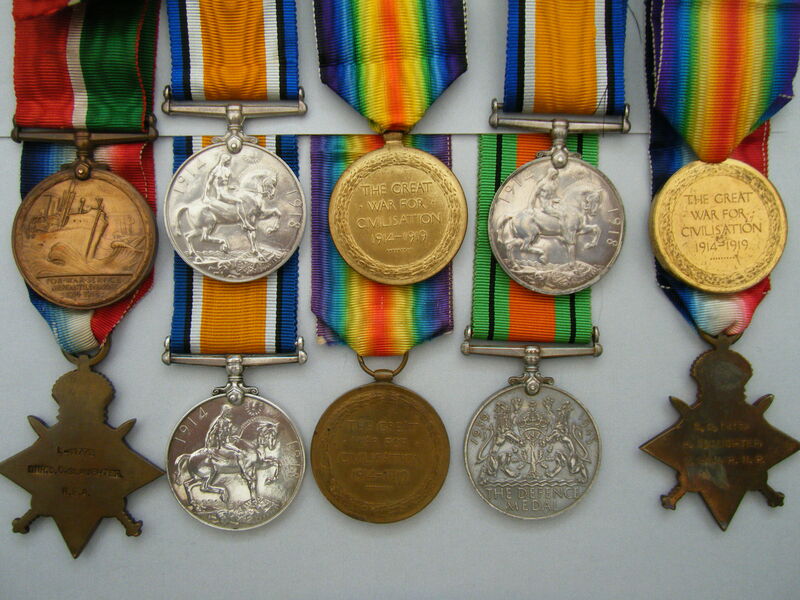 British War Medal and Victory Medal named to LIEUT. W. H. SLAUGHTER R.N.R. 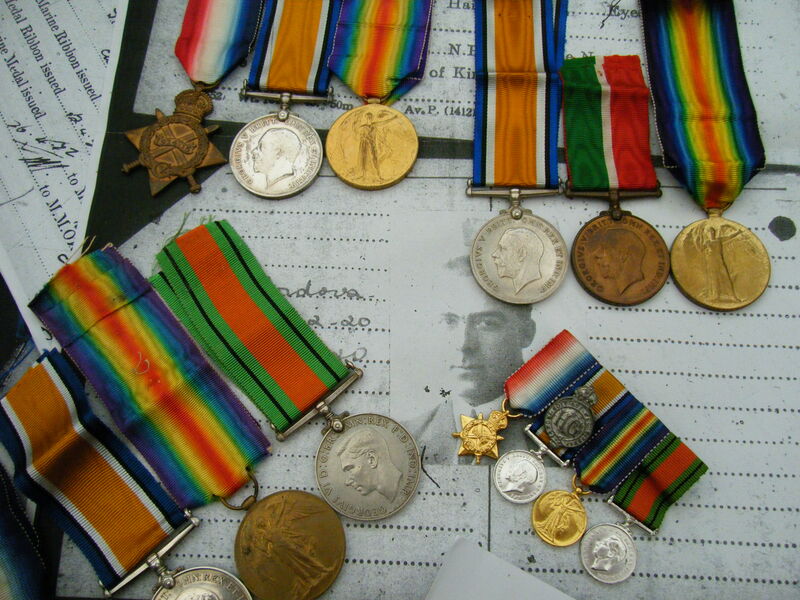 Included with this listing is a paper copy of his service records and a copy of the medal roll entry for his Royal Navy and separately his Mercantile awards. All three groups are sold with original ribbons.